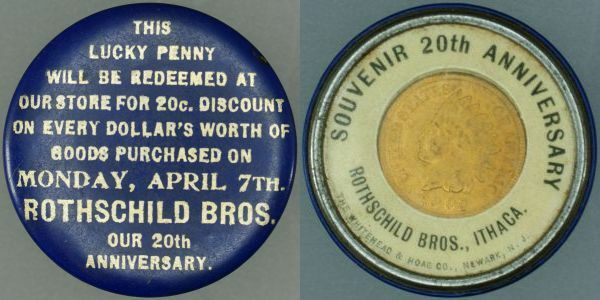 Encased coins are thought to first have made in 1901 for the Pan-American Exposition. Originally aluminum was used as the outer ring to encase a 1-cent piece. Aluminum is thought to be used due to it being relatively inexpensive and easy to press with advertising slogans. The majority of encased coins have a slogan similar to Keep Me and Never Go Broke or Keep Me and Have Good Luck . There are variations of this theme, but the thought was that people would keep the encased coin as a pocket piece and thereby keep the business name and information top of mind . At the Pan-American Exposition, several kinds of encased coins were sold as souvenirs, including round, horseshoe shaped, frying pan shaped and round vulcanite encased. Vulcanite is a plastic material made by mixing rubber and sulfur. It was invented and patented by Charles Goodyear in 1846. 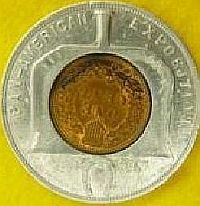 Sometime after the Pan-Am Expo another type of encased cent was introduced. The encasement was made of celluloid . Celluloid is a plastic compound created in the 1850's, using nitro cellulose and camphor. Nitro cellulose is a flammable compound and camphor a white crystalline powder which emits flammable fumes. It was the first synthetic plastic ever used. Dyes and other agents were added for color and stability. The material is easily molded and shaped and was widely used as an ivory substitute. It was mainly used in the motion picture industry and commercial photography. Celluloid as a film medium was first thought to be have been used by Thomas Edison in his early motion picture experiments. It is highly flammable and was replaced by acetate in the 1950's for film. The piece above advertising Ramos Gin Fizz / Gin Phizz . The colors and smooth surface plus the ability to print the slogans made this a step up from the aluminum encased. This particular piece is advertising a popular New Orleans drink. The drink was first served at Henry Ramos' Imperial Cabinet Saloon in 1888. It is a frothy gin drink still made today. The Ramos piece is 28 mm in diameter and, as can be seen from the image, the coin side has no room for any additional inscriptions. Above are three additional BB & N Co. /Balto. MD. encased celluloid cents. All four pieces have Mfg. By B.B. & N. Co./ Balto., MD on the edge of the celluloid. 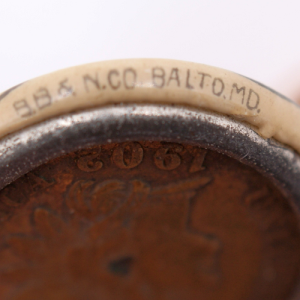 Research has shown that this is the Baltimore Badge & Novelty Co. - I have one additional piece of the same size (22 mm) but with entirely different printing, It says, "Land of Lincoln ' BALBO / Makes Cents", which has a 1964-D cent. The manufacturer of this piece is currently unknown. A "Google" search turned up nothing on the candidate although it must have been an Illinois political office. Here is another button encased. It is from Neekoosa, Wisconsin. The coin side reads, Compliments of A. Zurfluh, Neekoosa, Wis. Xmas 1901 . The celluloid side reads. KEEP • ME • AND • NEVER • GO • BROKE I BRING GOOD LUCK . 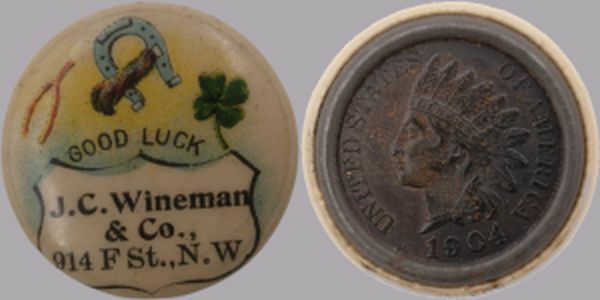 The four leaf clover and horseshoe images are the central design on the celluloid side. The manufacturer of this piece is currently unknown. Here is an additional celluloid encased that I do not own. I will happily give credit to the owner or remove if requested. Whitehead & Hoag Chester Hoag, left, (1860-1935) and Benjamin Whitehead (1858-1940) formed Whitehead & Hoag in 1892. Benjamin Whitehead was a printer, printing programs for local picnics and parties. He also printed badges on silk. He and Chester Hoag had a business relationship, which became a friendship and then a partnership that was incorporated in 1892. It was soon to become the country's largest manufacturer of advertising novelties. The company acquired three major button patents prior to its immediate step into button creation in 1896. A patent, filed Dec. 6, 1895, established the reverse design of celluloid buttons. Issued as a "jewelry" patent to George B. Adams, assignor to W&H, it specified a shell with a marginal rim to form a chamber and contain a continuous piece of wire with both a holding portion and a free end lying in the same plane. - (footnote: www.tedhake.com/viewuserdefinedpage.aspx?pn=whco). The following celluloid encased are products of the Whitehead & Hoag Co. at the bottom of the coin side. 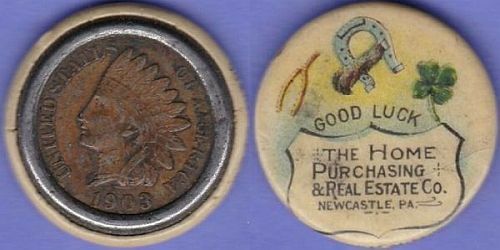 Note the Whitehead & Hoag CO., Newark, N.J. on the coin side. This piece is interesting in that is has a cross of the Knights Templar in the center. This cross is know as a Passion Cross . It rests on top of two crossed swords. Their motto In Hoc Signo Vinces , (By This Sign Thou Shall Conquer, is a literal translation) is on a ribbon at the bottom of the cross. Google maps shows 624 Market Street, in the middle of the intersection of Market and Montgomery Street. Searches for The Lacy do not return any relevant information. Also of interest are the four Maltese Crosses at the ordinal points of the cross. Finally I wonder what the significance of September 1904? 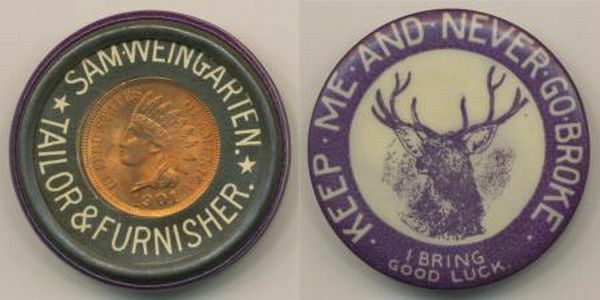 Whitehead & Hoag were making ribbon badges and celluloid parts when the "button" was patented. Their idea swept the country. 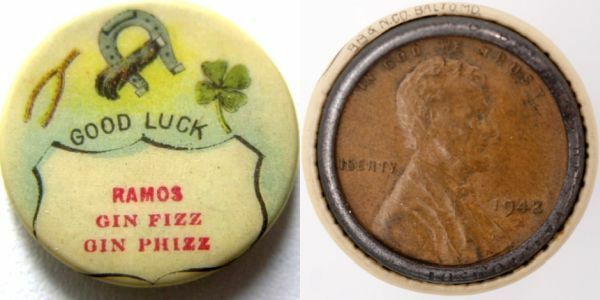 Buttons were used as advertising buttons and political campaign buttons. Their first big order went to the American Tobacco Co., at the rate of 1 million a day. 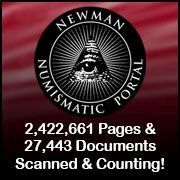 How many of the encased buttons were made? No one knows. They are similar to encased mirrors and political buttons as the print side is smooth and shiny. Encased mirrors have the coin embedded in the print side and have an inexpensive polished steel plate for a mirror. Political buttons are usually pin back items with a political slogan. 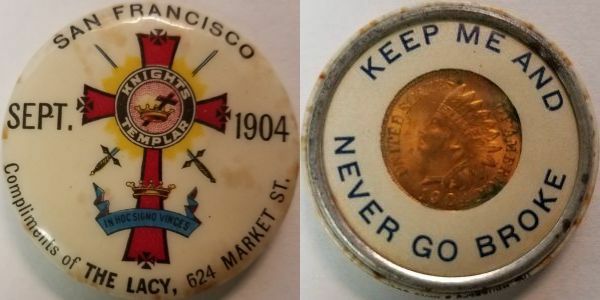 Below is an example of a "pin back" celluloid that Whitehead & Hoag made for the 1901 Pan American Exposition. The above image clearly shows the Whitehead & Hoag copyrights from April 14, 1896 and July 31, 1896. The H. B. Windrath 191 Seneca St., Buffalo, N.Y. is probably the vendor that sold them at the Expo. The encased mirrors below are shown for contrast and to illustrate other celluloid coin related products. I do not know the manufacturer of this piece. Celluloid encased 1910 cent - advertising mirror for Shulman's garments.